Whether you are seeking to get involved in student organizations or discover what events are happening around campus, Anchor Link is your key to connecting with student life. 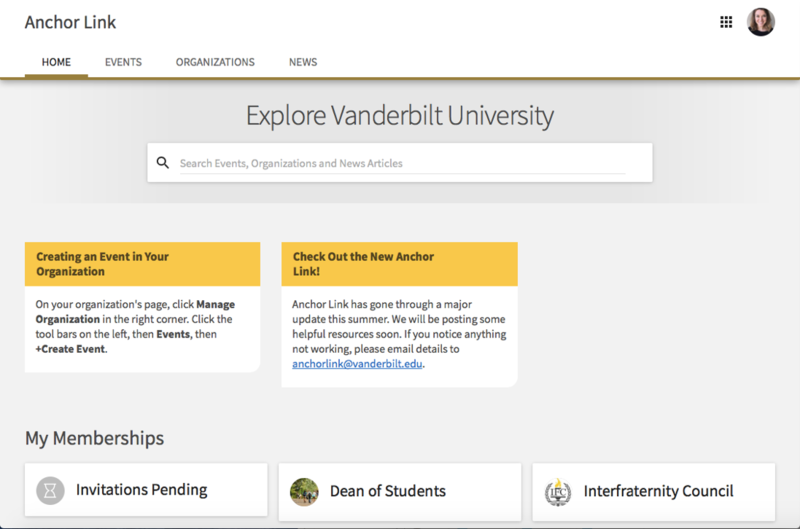 Anchor Link has both a public version of the site as well as a customized view with additional content for campus users who are logged in using their VUnet ID. Explore view is the default view when users log into the community. Clicking on Explore will take you to the community home page, where users can see important campus alerts, their organization memberships, check out upcoming events, read news posts, find shortcuts to their co-curricular Paths, and helpful Campus Links. The Explore view is also where users can view organization pages and access content created by organization officers or administrators. Every user in the community will have access to the Explore View. The public Anchor Link site is accessible to anyone with an internet connection. 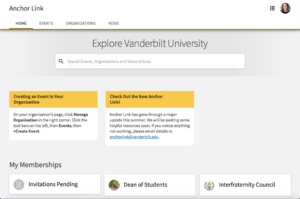 Organizations in Anchor Link can choose whether the events and content they create is shown to “Anyone in the World”, “Students & staff at Vanderbilt” (users must be logged in with their VUnet ID), or “Organization Members” (only visible to members on their roster). 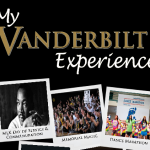 Clicking Events in the white toolbar will allow logged in users to access the complete listing of events registered to “Anyone in the world” and “Students & staff at Vanderbilt.” Events that are visible to organization members only will also be shown here, if you are a member of that organization. Search for events by date, name, theme, category, and perks. Clicking Organizations in the top toolbar will allow the user to access the complete listing of organizations in the system. Search for organizations alphabetically by name, or by category. 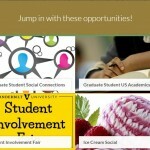 Clicking on an organization’s name will provide basic profile information for that organization as well as any content they have chosen to display publicly or to campus users. The news feed displays all news articles posted by organizations. 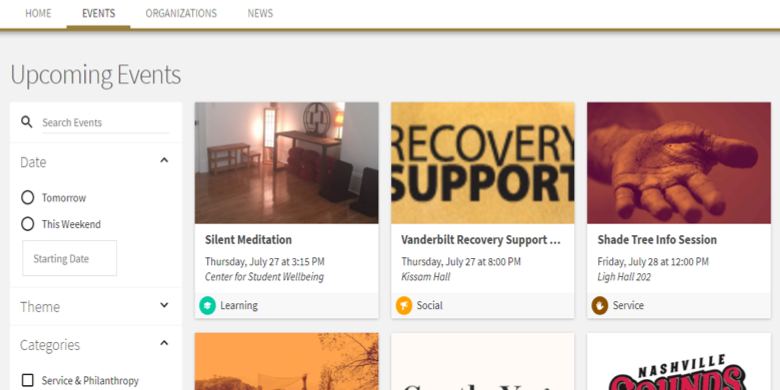 The news feed always displays “Public” articles and will also display “Campus Only” articles when a user is logged in.